Salvatore Cimmino understands the importance of a small, but grand, gesture especially for those who are disabled and often forgotten. 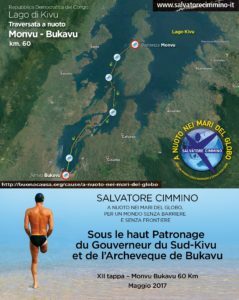 On May 10th, Cimmino will attempt a 60 km solo swim from Monvu in Bukavu across the Lake Kivu, one of the African Great Lakes, in the Democratic Republic of Congo. "My goal is to remind the world the suffering of a population that deserves to live in peace." While his swims are a dramatic embodiment of his goal to help others and increase awareness of the plight of the unfortunate, it is his gestures that Cimmino does on a daily basis that are truly indispensible. On March 4th, he had milk delivered to the Hospital of Bukavu - donated by the Liceo Pythagoras-Cross Torre Annunziata - that helped save many children from a premature death. Later in the month, he will have delivered medical aids and equipment for people with disabilities in the Caracciolini Community Kamole on the island of Idjwi, one of the world's largest inland lake islands. "The transportation will be provided by the Ministry of Foreign Affairs - DG of the Italian Development Cooperation," Cimmino explain [see explanation below by Ambassador Pietro Sebastiani]. Cimmino's A Nuoto Nei Mari Del Globo carries on quietly, dramatically and practically.